Besides the aim to provide an artistic product with the highest quality possible, theaters face two conflicting objectives that affect their pricing strategies. On one hand, theaters aim to increase box office revenue as a consequence of the systematic reduction in public funds. On the other hand, they pursue the objective to increase their attendance in accordance with their mission to spread culture to as many people as possible, and also in order to avoid empty seats in the venue that can have a negative effect on the reputation of the theater. In order to find a balance between the rate of occupancy and profitability, theatres usually charges different prices for the same production, in consideration of the heterogeneity of willingness to pay among theatregoers. 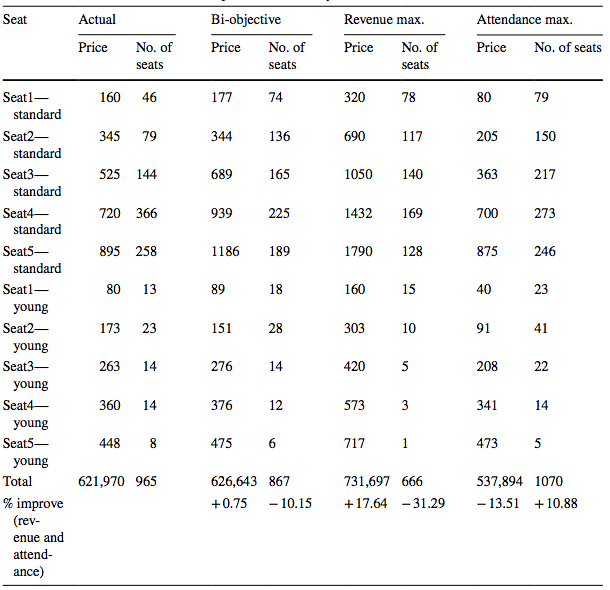 A common practice is to provide incentives to customers to discriminate among themselves according to their willingness to pay, offering a schedule of different prices according to the seating area in the venue (see Figure below as an example). Doing so, each consumers will choose the seat location in the venue according to his/her reservation price and preference. In this context, both the price of each seat tier and the number of seats to assign to them represent decision variables that may encourage an orientation of the theater toward either the maximization of the total attendance or the maximization of revenue. Just to give an idea of how the price and allocation policy may affect the objectives of the theatre, it is sufficient to consider the possible buy-down and buy-up behaviour, in which the customers buy a ticket for a cheaper or more expensive seating area when their desired seat is not available. In such a case, the price of each seating area and their availability may affect not only the type of tickets purchased (and hence the box-office revenue), but also the decision to attend/not attend the performance (and consequently the total attendance). Our study takes into account these complex decisions and develops an optimization model that aims to determine jointly the price of the 5 different seating sections, and how many seats to assign to each seat tier. The optimization model is “bi-objective” in the sense that theatre pursue to maximize both the box-office revenue and total attendance. Being these objectives conflicting, there are multiple optimal solutions according to the importance the theatre manager attach to each of the two objectives. As a case study, we consider the Royal Danish Opera House (a part of the Royal Danish Theater). 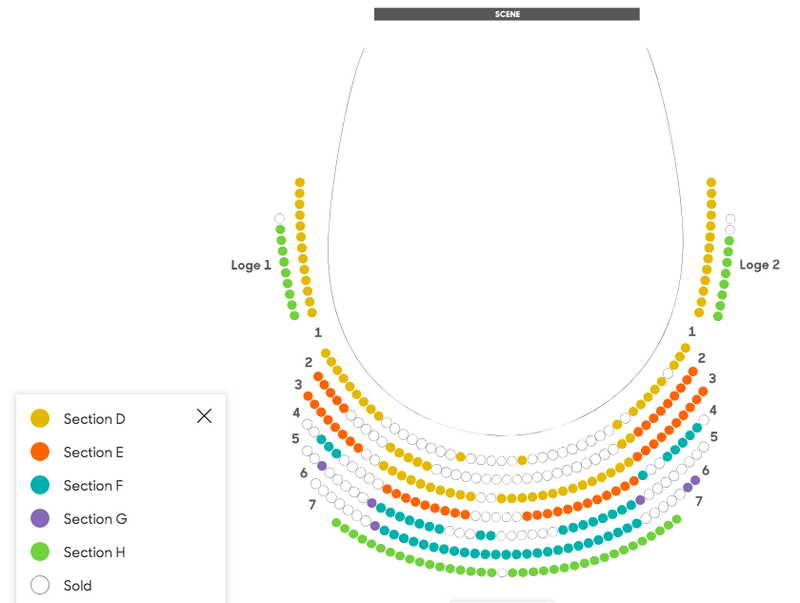 The model is tested using the booking data from the sale system of the Royal Danish Theater for the period 2010/2011 to 2014/2015, which contain, among others, the price of each seating area for each performance. The sample consists of 401 opera performances which took place during that period. Using the dataset, our model combines: 1) a demand function that predicts the total attendance based on the average price and several characteristics of the performance; 2) a choice model in which the probability to choose a particular seating area is estimated, given its price and the price of the alternative seating areas. The estimation is made separately for two customers’ categories: standard ticket buyers and young customers (which are entitled to a discount of 50%, made flexible in our model), assuming a different choice behaviour and price sensitivity. Table 1 shows the result obtained for a Saturday evening performance of “Tosca”. This table compares the actual results (Column 1-2) with one of the possible optimal solutions (Column 3-4) and two other bi-objective optimization models in which the decision maker wants to find the optimal solutions that provide the highest value, respectively, of the total revenue (Column 5-6) and total attendance (Column 7-8). The solution proposed leads to an increment in revenue of 0.75% and a decrease of the total attendance of 10.15%. However, if the theater aims to maximize the box-office revenue, it can adjust the price and size of each seating area such that the total revenue increases of 17.64% at the expense of a decrease of attendance of 31.29%. On the contrary, if the theater is attendance-maximizer, it can increase its attendance of 10.88% with a decrease of box-office revenue of 13.51%. Different simulations have been carried out considering performances with different level of occupancy rate, in order to derive some findings for managerial decision-making. As our simulations confirm the existance of a trade-off among the two objectives, the advice to managers is not about precise values of prices, but some directions in which the combination of price and seat allocation should take under the two different objectives. Table 2 summarizes our guidance inferred from our simulation. In conclusion, our study proposes a model that simultaneously optimizes the pricing and seating-allocation policy of a theater. From a managerial perspective, the model can provide theater managers with insightful policy implications in terms of demand-management decisions. Overall, our simulations clarify that both price and capacity allocation are leverages with which a theater can calibrate its objectives, even when revenue is not considered as the main goal to pursue. In our opinion, this is a crucial point in a period in which the public funds allocated to cultural organizations are decreasing and performing arts organizations are struggling to attract a broader audience and to achieve a balance between revenue and losses.